Unquestionably, Sesham is a step in the right direction. While approaching a subject that requires sensitivity and restraint, writer, director Rajeev Kumar sketches and probes the tenuous realms that separate the sane from the insane. Will society accept a man who has spent a good part of his life in a mental asylum? Meera, (Geetu Mohandas) fresh out of the Film Institute wants to do an offbeat documentary on a mental asylum and its inmates. 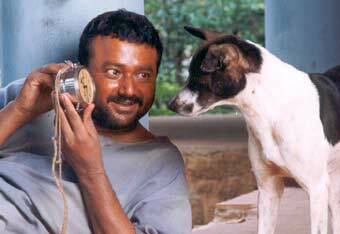 She stumbles upon Lonappan (Jayaram) a lovable inmate who is walking on the thin line between insanity and sanity. He runs his life according to the dictates of his alarm clock. Meera gets fascinated with the child like Lonappan and makes him the protagonist of the story that she is shooting. She takes him out of the asylum and tries to rehabilitate him, but the society rejects him. And in a gut-wrenching climax, Lonappan comes back to the asylum where he belongs. Meera gets an international award for her debut film and here the story ends, leaving a lump in your throat. No two ways about it, Rajeev Kumar consolidates his reputation as one of the finest upcoming directors of Malayalam cinema today. Both, as a writer and director he narrates the plot with simplicity and clarity. Technically the camera work of Rajeev Ravi is commendable and so is Sreekar Prasads crispy editing. Jayaram lives the role of Lonappan and the actor has come up with one of his best performance till date. The effect is that of an actor who has grasped the complex nuances of screen acting. Geetu Mohandas is also outstanding as Meera stealing some of the scenes with her spontaneity and vivacity.